If you’ve heard of Donald Ray Pollock, it was probably due to his collection of interlinked short stories, Knockemstiff published back in 2009, set in the titular town. His debut novel, The Devil All the Time (Doubleday) treads similar ground, spending most of its time in rural southern Ohio and West Virginia in the late 1950s and early 1960s, tracking and recording a wide range of psychopathic behaviors by a motley crew of misfits and delinquents. What Pollock does so well is create a place and time where nothing he says or shows us is beyond belief. From the beginning we see how things are in Knockemstiff, and we understand the desperation, the need for prayer, the aching hope that something will change and improve. Arvin eventually sets out on the road and leaves behind his tortured past, but the road is not easy or kind. Out on the highways and back roads are people like his neighbors, Carl and Sandy Henderson. Carl likes to take pictures of his naked wife fondling strange men, before and after he puts a bullet in the stunned hitchhikers, leaving bodies all over the southern states. Sandy bartends and whores, quick to jump in the sack with whatever man gives her an iota of grace and kindness, never phased by the violence she witnesses up close. We also follow a preacher, Roy, and his crippled, deviant guitarist Theodore, as they travel from a bewildered church to a circus filled with horny bird-women and drunken clowns to a desperate life as field hands and hobos. Carl and Sandy have cast a wide net, and eventually they pull in the tired, beaten down Roy, and ask him to be one of their models. We come to expect the worst, so when it arrives we are not shocked, but instead hypnotized, wondering when the dark souls who dance about the page will finally get their comeuppance. We wait for justice to descend, for all of the cruel, violent acts to be punished, for the righteous to be redeemed in the end. 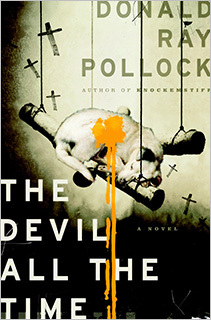 What Donald Ray Pollock has created in The Devil All the Time is a dark, engaging portrait of human nature. He shows us what happens when there is nothing to believe in, when there is little chance of things getting better, when instead of the grace of God whispering in your ear it’s the devil—all the time. This novel is not for the weak of mind or heart. It is for the devout, those with strong character and a firm grip on their own ascent into heaven. RICHARD THOMAS is the author of three books—his debut novel, Transubstantiate (Otherworld Publications), and two short story collections, Herniated Roots (Snubnose Press) and Staring Into the Abyss (Kraken Press). He has published over 75 stories online and in print, including the Shivers VI anthology (Cemetery Dance) with Stephen King and Peter Straub, PANK, Gargoyle, Weird Fiction Review, Midwestern Gothic, Arcadia, Pear Noir!, Word Riot, 3:AM Magazine, and Opium. He has won contests at ChiZine, One Buck Horror, and Jotspeak and has received five Pushcart Prize nominations to date. He is also the editor of two anthologies: The Lineup (Black Lawrence Press), and Burnt Tongues (Medallion Press) with Chuck Palahniuk, both out in 2014. In his spare time he writes book reviews, as well as a column (Storyville) at Lit Reactor. He is represented by Paula Munier at the Talcott Notch Literary Agency. He can be found on Facebook, Twitter, and his blog. As usual, a great, thorough and insightful review, Richard! I loved DEVIL ALL THE TIME and adore Donald Ray Pollock. Thanks, Jessica. I’m a big fan of his work too, loved Knockemstiff. He’s a great guy as well. I’m hoping to catch up with him in Corydon, IN for Frank Bill’s release. I first met Don when he opened up for Chuck Palahniuk in St. Louis. Wild reading. Sounds intense. Great review. Putting ‘devil all the time’ in the reading queue. Thanks, Chester. Be sure to pick up Knockemstiff too, at some point.